New Display Box for View Mates with Separater Bar. Lots of new functionality with this new display box! Mirror Components – You can choose from different options for component positions. All the mirrored components appear under a Mirror Components feature. Components are fully defined…no additional Mates necessary! Simulation – Solution Optimization options that will allow you to resize the model based on properties defined. Example would be setting a specific volume…then let SolidWorks find the optimal model parameters! It looked like you could set several parameters for optimizations. Multi-Bodies allowed in Sheet Metal parts! You can also mix Sheet Metal and Weldment features with no issues! Also better DXF output options for sheet metal flat patterns. New Reference Plane options! The interface for Plane creation looks similar to the 3D Sketch Plane creation process. New options include Midplanes and Tangency to two faces and Tangent to face plus parallal (or angled) to another Plane. The Plane creation options appear as you select entities. Configuration Builder – You can build a form with something that looks like the Property Tab Builder and then use this form to easily create configurations. You can set it up any way you want with Yes/No answers and custom fields. VERY COOL! Allows you to configure on the fly too! Drawing Annotations – GTol, Surface Finish, and Datums can be attached ANYWHERE to dimension extension lines. You can combine notes with a simple drag and drop! This looked REALLY nice! Perhaps this will allow you to store custom notes individually in the Design Library then add them one by one? Drawing Balloons – User input Balloon size (using a number). Youc an also automatically show the Quantity beside the Balloon just by clicking turning on the option! Drawing Dimensions – New heads up display that allows you to modify the dimension, tolerance, and other day all in one window without having to step through the PropertyManager. Also – When you add dimensions to a drawing, other dimensions will now automatically shift outward or inward keeping the proper spacing! Drawing Center Marks – You can add Center Marks AFTER dimensions are created and the dimension extension lines will automatically trim to the Center Mark! Drawing Tables – Excel table functionality through all SolidWorks tables! Heres a BIG ONE – Direct Editing – Enhanced Move Face tools that allow you to move imported features on the fly all from the Graphics area. There was also a new direct editing tool that allowed you to modify patterns of holes in an imported part all at once! The UI looks to be using the Instant3D rulers. The direct editing tools did create features in the tree which will allow users to easily revert back to the original imported state. Enterprise PDM – Replicate Toolbox data across mulitple vaults! – Converting Data and Print Jobs can now be managed on a server. Full Machine Simulation that is integrated with National Instruments LabView! Well…that is the quick list. I’ll go back through this and see if I can elaborate more on some of the features when I write the General Session Post. SolidWorks World 2010 will be held in the Anahiem Convention Center in California. The dates are January 31st thru February 3rd, 2010. That’s all for now….Stay tuned…more to come!! Hi Ricky, do you know how much I love Christy's blog? I visit Southern Plate everyday… I even have the cookbook. Hope you're enjoying Disneyworld. Oh yeah, almost forgot! I love your wife's blog! I've already tried several of her recipes, and my family snarfed them down! I love your wife's blog so much! She bakes the best food ever. At Disney without your wife? Rickey Rickey Rickey. But, I really like her blog… it's amusing, informative, and useful, and that's the best part of blogs! Oh, and if you need luxury soap, I'm your gal. TrueSoaps is the name…. clean is the game! Have a great conference, and next time, take Christy! Just wanted to say that I absolutely love your wife's blog! What a wonderful site. Thank you for the nice summary on what's new in SW 2010. Was there any word on SolidWorks and Catia interoperability? There were some rumors after Barcelona that SolidWorks 2010 will be using Catia V6's kernel, perhaps in addition to Parasolid. It is a bummer when most SW competitors can read Catia V5 while SolidWorks can not. Hey Ricky, just wanted to say that I love your wife's blog. She makes the yummiest food ever. I wrote about her on my blog yesterday as being one of my favorites! I hope you do something really nice for her since you're in Disney World on HER birthday! I tried to leave a comment yesterday but evidently the response was overwhelming. I love your wife's site and hope she had a happy birthday. My own hubby would have been furious if I had done something like this. I hope you have been a good sport about all the responses you got. And I hope you know how many people appreciate what your wife does. Happy Birthday to Christy! You are in Disney World on your Wifes birthday while she is home alone with YOUR children?!?! Oh my Mr. Ricky. It's a good thing she has HER wonderful blog so we can all tell her how great HER blog is. I know it's the day after her birthday but in my house a Wife's birthday lasts all week. So I hope you get home before the week is out and be sure and visit YOUR WIFE'S fabulous blog. Oh, and your's is nice too. Can I post it on my Blog? I write in Portuguese only about Solidworks. I'll publish your name on Post Credits. So there is no new feature or enhancement for surface modeling… ? Nothing was mentioned at SolidWorks World on this. It is high on my list of enhancement as I'm sure it is on yours. 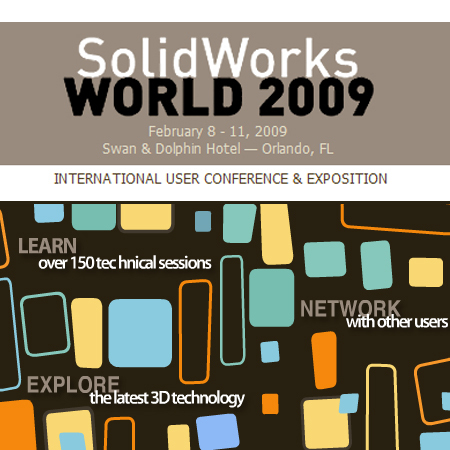 Just remember that the sneak peek that they offer at SolidWorks World does not include all the enhancements that will be part of SolidWorks 2010. I heard the rumors too…but they are still just that…rumors. With pretty much all competing products to SolidWorks having this capability, I personally believe that we will see some interoperability between Catia and SolidWorks in the near future. Time will tell. Make sure you sign up for the Beta program which should start in a couple of months. I'm glad you like the list! Posting that list to this site is one of my favorite things to do each year! Absolutely! Please just publish my name in the credits as you mentioned above and also please provide a link back to this post. As I mentioned above in one of my responses, they don't show all the upcoming functionality….just a sneak peek. We will have to wait until SolidWorks 2010 Beta in a few months to find out if there are any new surfacing tools. Just out of curiosity…what type of Surfacing tools would you like to see added to SolidWorks? hey ricky i love your wifes blog. i guess after all this you will not go out of town on her birthday again.have a great day and tell your wife happy birthday for me. A “replace and simplify” tool, which would take an existing set of faces and drape a simpler single patch over them. I'm thinking of a quicker, ad-hoc way of fixing up the areas where, say, multiple fillets run into each other, for models which need to be good enough but not perfect. Unlike “Replace and Fill”, “Replace and Simplify” would conform not just to the edges of the quilt being replaced, but (to a variable degree) to the character of the faces being replaced. I visualise one or more blobs for each major point of inflection (summits and valley floors) from the preceding face set, which could be pulled or pushed to fine-tune how high or deep they stand from the surroundings, or alternatively deleted (individually) to blend into the 'mean sea-level' of the locality. Possibly also a global control for the 'peakiness' and 'valleyness' of the patch as a whole. Of the list of improvements they mentioned, for drawings I would have to have excel functionality. Direct editing is a step in the direction of reverse compatitibility. What platform will 2010 run on? Will they abandon XP? Any guesses as to memory requirements? I'm guessing that 2010 will still run on Windows XP. There are still FAR too many corporations out there who still have XP as their standard OS. I expect it can run on Mac OS X – Leopard. If it would get a functionality like Catia – imagine & shape,that will be a big step to help IDs. I really liked your article. Nice work! The list of improvements they mentioned, for drawings I would have Jasmin Wilson@Cute Love Quotes to have excel functionality. Direct editing is a step in the direction of reverse compatibility. Great post, what you said is really helpful to me. I can't agree with you anymore. I have been talking with my friend about, he though it is really interesting as well. Keep up with your good work, I would come back to you. I am excited about the improvements on Mirrored components. That will be great for us. What about the problems with virtual parts? We consistently have parts disappear when we use the virtual parts function, so we basically save all our parts out to separate files. For my specific needs, it would be much better to be able to use the virtual parts function reliably. I haven't used virtual parts all that much. I'll be on the lookout for this during the beta period. As for the mirror tools, they looked REALLY nice. I'm looking forward to testing that too. The list sounds great, some well needed enhancements. Any idea on what kind of hardware requirements for optimal performance. We are getting ready to upgrade all our workstations and it would be nice to know as much as possible in advance. There is nothing posted as of yet on this. I am beta testing it right now and have seen no hardware related issues. I'm running it beside my SolidWorks 2009 install on my Dell M6400. Looks like a great list of update there. I'm using XPx64bit, I hope there won't be a problem. well, the new features of SolidWorks 2010 were revealed. Here's a quick list. This is neat and solid information. Thank you.